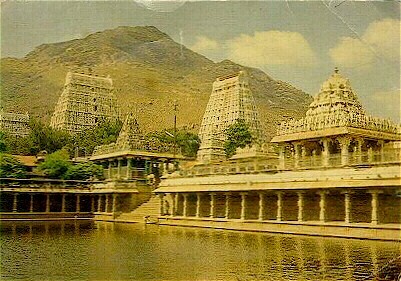 Significance: Tiruvannamalai the home of Annamalayaar or Arunachaleswarar (Shiva worshipped as a Shiva Lingam) and Unnamulaiyaal (Apitakuchambaal - Parvati), is one of the largest temples in India. It occupies a special place in the Saivite realm and is regarded as one of the Pancha Bhoota Stalams (one of the five grand temples associated with the five basic elements)  associated with the element Fire, the other four being Tiruvanaikkaval (Water), Chidambaram (Space), Kanchipuram (Earth) and Sri Kalahasti (Wind) respectively. Shiva is said to have manifested himself in the form of a massive column of fire, whose crown and feet, Bhramma and Vishnu attempted in vain to reach. A celebration of this manifestation is seen today in the age old traditions observed in the Shivaratri and the Kartikai Deepam Utsavams held here. Antiquity: There is an air of deep mysticism around the temple, the hill and its environs and the town itself has been known for its long association with Yogis, Siddhas, the well known spiritual savant Ramana Maharishi and several others. The origin of this temple dates way back in time, although much of the temple structure as seen today, is a result of building activity over the last one thousand years. Seventh century Tamil poetry glorifies this temple. All of the four Saivite Saints Appar, Sambandar, Manikkavacakar and Sundarar have sung the glory of this temple and it was at this temple that Arunagirinathar began composing his immortal work Tiruppugazh. Muthuswamy Deekshitars kriti Arunachalanatham pays tribute to the presiding deity of Tiruvannamalai. Architecture: The ancient and vast Arunachaleswarar Temple as it stands today is the result of several centuries of building, alteration and extension. A Nandi faces the main shrine in each of its five prakarams. The outermost prakaram houses the thousand pillared hall and the Shiva Ganga tank and is pierced on four sides with colossal Gopurams. . The fourth prakaram includes the Bhramma Tirtham, and its eastern gateway Vallala Gopuram holds a statue of King Ballala. The third prakaram which dates back to the 12th century AD has several Linga Shrines, and the Kili Gopura Entrance. In the East side of the prakaram stands the Flag Staff while the Northern side is home to the massive shrine of Unnamulai Amman. The 3rd prakaram surrounds the roofed 2nd prakaram which houses the pantheon of deities associated with Shiva, which in turn surrounds the shrine of Annamalaiyar. An elaborate protocol of worship services marks each day at the Tiruvannamalai temple where about a hundred and fifty people are attached to the temple including priests, musicians, singers, carpenters, potters, washermen, palanquin bearers, garland makers, administrators, guards etc. The day begins with the ceremonial arrival of Ganga to the shrine, from a tank in the Southern part of the town on an elephant through the Southern, Tirumanjana Gopuram. This water cleanses the entrance to the second prakaram, and then the next ritual involving the waking up of Shiva and Parvati in the bedchamber. The Shiva-Meru returns to the Annamalaiyaar shrine while the image of Parvati returns to the Unnamulaiamman shrine. Six other pujas are offered at the temple, the first one at 6 am, and the last one at night where the Shiva Meru and the image of Parvati are processionally brought into the bed chamber. Each service is accompanied by chants of invocation, dedication and praise. In the south west corner of the prakaram, the sacrificial fire ritual takes place, ending with the consecration of vessels of water which are used in the ablution of Annamalaiyaar and Unnamulai Amman. Several festivals dot the Tiruvannamalai temple town's calendar. IEach occurrence of the full moon is a celebration in itself, as hundreds of thousands throng to circumambulate the Annamalai Hill, considered to be a reperesentationof Annamalaiyar himself. The festivals of the temple are remarkably intertwined with the life of the locals, marking the so called subtle transcendence between the human and the divine states. In addition to the various festivals, Tiruvannamalai celebrates four annual Bhrammotsavams (10 day festivals) the most famous of which is the Kartikai Bhrammotsavam (in the Tamil month of Kartikai Nov 15 - Dec 15). The Arudra Darisanam in the month of Margazhi (Dec 15 through Jan 15) is a celebration of the cosmic dance of Shiva. The Tai Poosam festival which occurs in the month of Tai (Jan 15 through Feb 15) is also of great significance. The Tiruvoodal festival, enacting a mock quarrel between Annamalaiyaar and Unnamulai Amman is enacted in the presence of Sundaramoorthy Nayanaar in the Tiruvoodal Street, a street that has been earmarked for this annual event. During this quarrel, Parvati enters the temple alone by herself, leaving Shiva outside, and Shiva (Annamalaiyaar) circumambulates the Annamalai hill (himself), and during his trip, grants liberation to the rishi Bhringi. His jewels get stolen in the West side of the town and he then recovers stolen jewellery in the eastern side of the town, and then returns to the temple the folowing morning. In the month of Maasi, (Feb 15 through March 15) Shiva is crowned as the King in the absence of a royal heir to King Ballala of the Hoysala dynasty (an early 14th century ruler) whose statue adorns the Vallala Gopuram. Interestingly Ballala's death is announced as an element of the festival tradition during the Tai Poosam celebration season. Associated with these events, Annamalaiyaar visits Pallikondapattu, one of the villages to the east of Tiruvannamalai, where the King's palace is said to have stood. The Parivettai (Royal Hunt) festival is a part of the two Bhrammotsavams celebrated during the winter and summer solstices. This festival represents a royal hunt on the borders of the town. The celebration of Kartikai Deepam marks the conclusion of the ten day Bhrammotsavam in the month of Kartikai (Scorpio , Nov 15 through December 15). Each of these festival days is marked by the procession of the Pancha Murthys (Somaskandar (Annamalayar), Unnamulaiyaal, Ganapati, Subramanyar and Chandikeswarar) in gaily decorated mounts. Most noteworthy among these are the Rishabha Vahana Utsavam celebrated on the fifth evening of the festival and the Rathotsavam, celebrated on the seventh day of the festival. Kartikai Deepam is preceeded by the Bharani Deepam celebration when a lamp is lit in the main shrine of the temple following a fire sacrifice before the shrine of Surya. A small bowl of ghee lighted at this fire is used to light five other lamps representing the five aspects of Shiva. Preparations begin for the Kartikai Deepam which is to be celebrated in the afternoon. A group of fishermen carry a portion of this fire inside a container of baked earth to the summit of the mountain where a large copper utensil filled with offerings of ghee and pieces of cloth has been placed. Crowds begin to throng the temple complex, and a discernible order prevails among the crowd as the tens of thousands gathered begin their patient wait for the auspicious moment when the Deepam celebration would reach its peak. In the meanwhile, preparations go on for the afternoons climax. Four of the five decorated Pancha Murthys are are brought out from the main shrine of the temple and housed in Vimanams in the 3rd prakaram of the temple, facing the flag staff and the Annamalai Hill. The last to arrive is Annamalaiyar who comes out of the second prakaram, dancing with his consort. The crowd waits to catch a glimpse of the deepam which is then brought out of the inner shrine towards the Utsavar Annamalayaar. The anticipation of the lakhs gathered there can only be experienced, not described in words. The deepam is brought out in a gait by the bearers and a deeparadanai is offered to the Utsavar, and at this very instant, the lamp on the hill is lighted as the crowd breaks into a frenzied devout cheer, yet retaining the order that was there when it was just beginning to assemble. The human mass gathered within and around the precincts of the temple, along with the residents of the town and neighboring towns catch sight of the flame atop the Annamalai hill, cherishing the age old belief that it is a representation of Shiva himself, who appeared in the form of a flame whose origins could not be deciphered by the other two of the Trinity namely Bhramma and Vishnu. Keeping with tradition, the inner sanctum doors close, with the arrival of the deepam outside, and it is believed Annamalaiyaar is to be worshipped only as the beacon until the next morning when the shrine is reopened. Access and Accomodation: Tiruvannamali (located in the erstwhile North Arcot district of Tamilnadu) has several hotels and ashrams and it attracts visitors from all over the world Ramanashramam and Seshadri Swami ashram being examples. Each occurrence of a full moon attracts hundreds of thousands of pilgrims. The Kartikai Deepam celebration also attracts lakhs (hundreds of thousands) to the extent that all incoming traffic is halted at the boundary of the town on the day of the festival. The government of Tamilnadu runs special bus and train services during the occasion. By car, it is a four to five hour drive from Chennai, and there are several 'point to point' non-stop bus services. Tiruvannamalai is located on the railway line linking Villuppuram and Katpadi, and is therefore connected conveniently by rail to centers such as Tirupati and Thanjavur. Tirukkoilur with the Trivikrama temple and the Veeratteswarar temple, Saathanur Dam, and Vellore with its Jalakanteswarar Fort Temple are some of the nearby attractions.